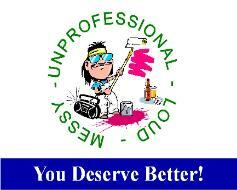 At Perfect Painting Plus we treat our clients with Respect! privilege of entering your home, you have allowed us into your personal space. we make considerable effort to provide "Maximum Quality with Minimal Disruption." own music, talk loudly, swear, smoke, drink alcohol, etc., in your home. When we work for you, we focus on you and the job at hand. on their house and in their home. and we make sure that you are!